FLINT TWP. 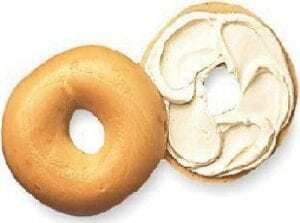 — Bagels with low-fat cream cheese are off the menu at Carman-Ainsworth Schools. So are animal crackers, fig cookies, cheese and meat pizza, granola bars, baked chips, low-fat popcorn, soft pretzels with mustard, pudding and cereal bars. The school board conducted a required federal review last week of its instructional policy on wellness education and food service but no action was needed. Superintendent Bill Haley reported to the board several administrative changes to the policy including the removal of the aforementioned snack foods which was done to comply with current food service rules. Items remaining on the approved snacks list include fresh fruits and vegetables, yogurt, baby carrots and other vegetables with low-fat dip, trail mix, nuts and seeds, string cheese, 100 percent fruit juice and bottled water (including flavored). “It mostly has to do with food items prohibited going forward as part of our food service,’’ Haley said of the policy review. The changes targeted foods the government considers to be unhealthy and contributing to obesity in children. In an unrelated food item, the board was informed by assistant superintendent Russ Parks that there is no Lean Finely Textured Beef (also known as pink slime) being served in the district. Parks submitted a statement from the C-A’s meat vendor assuring it does not purchase “pink slime”. More menu changes are coming in the National School Lunch Program beginning in the 2012-13 school year. In January, the USDA approved the first major nutritional upgrade in school meals in 15 years. The move toward serving more nutritious meals was championed by First Lady Michelle Obama. Under the new meal plan, burritos and breaded beef patties are out and whole wheat spaghetti and fish nuggets are in, according to a sample menu on the USDA website. The more nutritious meal standards will affect nearly 32 million kids who participate in school meal programs. Schools with federally-funded meal programs will focus on improving the lunch menu next school year and gradually phase in changes to breakfast and other food service over a three year period. Vending machine offerings will also change. “As parents, we try to prepare decent meals, limit how much junk food our kids eat, and ensure they have a reasonably balanced diet,” First Lady Michelle Obama said in a press release when the new standards were announced.. “And when we’re putting in all that effort the last thing we want is for our hard work to be undone each day in the school cafeteria. “When we send our kids to school, we expect that they won’t be eating the kind of fatty, salty, sugary foods that we try to keep them from eating at home. We want the food they get at school to be the same kind of food we would serve at our own kitchen tables,’” Obama said.